"Very nice location and architecture." Have a question for Ana Mandara Villas Dalat Resort & Spa? "Great setting with old French villas!" "Fantastic staff made this short holiday memorable." 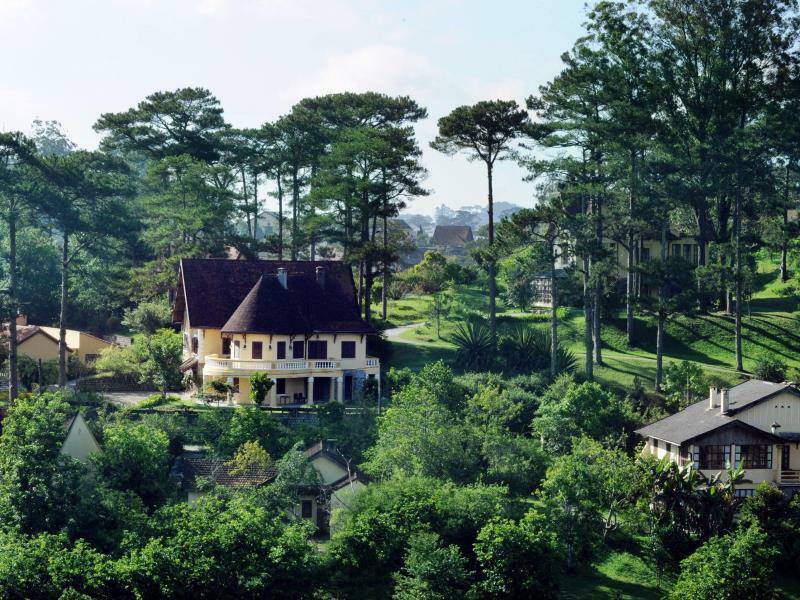 Set in the rural highlands, Ana Mandara Villas Dalat Resort & Spa invites you to experience the tranquil atmosphere of Dalat. With its convenient location, guests are able to reach Dalat's city center within a 5-minute drive. Designed in a colonial style, this award-winning property boasts a 72-room resort, each originally constructed between the 1920s and 1930s by the French settlers. All villas are well-preserved, fully reflecting its unique and original design, décor, and charm. Expect the claw-foot tubs, billowing sheer curtains, and elegant four-poster beds. All in all, Ana Mandara Villas Dalat Resort & Spa is the perfect choice for travelers who want to get away from the bustle of city life. "Beautiful landscape, pure & tidy resort." Resort shuttle bus service transfer from/to resort and city center. Please contact The Resort for more information. Breakfast for children costs USD 10. Children 6-11 years old will be charged USD 10 when using existing bedding. Children 12 years and over are considered as adults and will be charged USD 40 per night. My family had 2 night stay in this French colonial villa compound. We chose this place because it reflects the most symbolic vibe of Dalat, a highland which was discovered and developed by French on the first days. And the place didn't disappoint us at the first sight. Nice smooth check in with welcome tea in an early cool breezy morning. We booked a villa studio and our room in real was bigger than we thought, it has 1 living room, 1 huge bathroom and 1 master bedroom. All of these are inside a 100 something year old villa , located across the restaurant and very close the the pool and gym. Because the resort is quite close to the city center, it is easy to get there for lunch or dinner. So if you want to be in a hotel which has retro vibe, good location, green, quietness, this is the right place. The hotel has a very good breakfast with variety of choices from local to western dishes, especially vietnamese beef noodle soup Pho, you can have it here with the excellent quality (I am local vietnamese, trust me) which is rarely found in hotels even the good ones in Vietnam. Regarding to the staffs and service, we actually can't have any negative comments. Very helpful attentive staffs in front-desk as well as in the restaurant. Very friendly hard working electric car drivers (because the villas are located quite remotely from the reception so we need these cars to travel back and forth, even at night, however the service is just available before 10pm as I remember ) So this a really a perfect resort for those who want to experience the old style of dalat and have a wonderful time with family and friends. The toilet and shower should have their own doors as it is quite uncomfortable for the user to be seen when anyone else is also in the bathroom. Tiles should be anti-slip instead of polished cement. There should be guest welcoming items such as fruits or sweets/chocolates. The management can consider planting more flowers near each villa to make the surrounding more colorful and beautiful. Lovely villas situated in beautiful grounds around 5 mins from the centre of town. Our villa was clean(ish), but rather tired & lacking of any noise insulation - our upstairs neighbours sounded like a circus troupe. Otherwise we found the staff warm, friendly & very helpful. Breakfast was good with a varied selection of western & asian food. The restaurant also served excellent cuisine with a choice of local & western dishes. Well located resort near the center of Dalat, nice staff but breakfast is not a good point in AnaMandara. I ate twice breakfast but felt hopeless (lack of food diversity) in comparing with others. Anyways, I spent all things well here, love opening the door everymorning to hear the bird sounds. Maybe I will be back in the next year. 4,5/5 star. Ana Mandara is a great choice for a stay in Dalat. The setting in the grounds of dozens of old French colonial villas is perfect. Beautiful gardens, pine trees, allotments growing fruit & veg that supply the excellent restaurant. Nice swimming pool in lovely setting. The rooms in the Villas are clean & spacious, with good size bedroom & bathroom. Staff are very helpful & courteous, especially Thanh & Dung who looked after are tours & arranged treatments in the gorgeous spa. Ana Mandara is a 20 minute walk or 5 minute taxi from town (50,000vnd), so you can get away from the bustle of town. Good town & countryside tours can be booked. Excellent breakfast. Highly recommended hotel. We fell in love the minute we arrived. The hotel lobby was peaceful and calming. The children literally ran off into nature. The resort has so much to offer for families from kids cooking classes to exploring in the garden. The staff ensured we had a good stay and we hope to return some day. Great setting with old French villas! Wonderful restaurant! Loved the old colonial style buildings. Big plus for the heater in the room very much needed. Tastefully renovated rooms in keeping with the villas' period, but more attention should have been given to soundproofing between floors - in the ground floor room I had too much noise came through from the room & people above. I would only recommend this hotel/resort if one could be assured of a room on the top floor. Hotel has many facilities. Kids club is very small and facilities are not well maintained but it's nice that hotel had provided a staff to watch the kids while my husband and I had a massage in the spa. The Spa is very good. We like the surrounding, nice to walk around. The pool was also very nice, but as it was the raining season, there was no one minding the pool area, the heated pool had lots of leaves floating and we had to call the reception to get the mattress for the beach chair. The restaurant had good food but compare to the prices outside in Dalat it's quite expensive. Beautiful my located on a hill, away from the crowd, the resort is a splendid escape from the hustle and bustle of the city. Dalat city is a walkable 20 minute away via a short cut through the houses which leads to a small road. The resort has spectacular views of the houses across the valley. 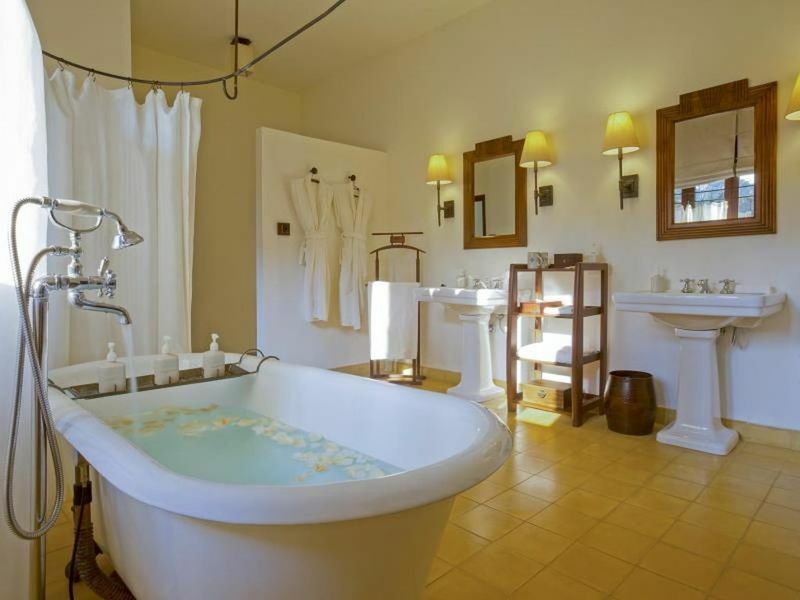 With the quiet serenity, it is a romantic get-away for a couple. as a resort, you won't expect the hotel to be that close to the town, but it's still a walking distance if 30 mins are acceptable for you. breakfast was a decent selection, hence service is nice. the room was clean, just one thing, leave the tap runs for at least 10 mins before you use them. Dalat is a hidden gem in the tropical South East Asia. 30 min flight from Ho Chi Minh brings you cool weather in a well appointed resort city. This was my 4th visit to Dalat and stayed this famous hotel for the first time. Cool and sweet morning air in the pine trees gave me total rejuvenated sensation. Though villas are becoming a bit old (though very nice), this massive garden full of pine trees is totally unique. Breakfast in such beautiful garden gives you a heavenly impression. Aroma from coffee factory standing right next to the hotel is a nice addition. If you are able to ride a motorbike, you can rent the one nearby. This will make your stay perfect. 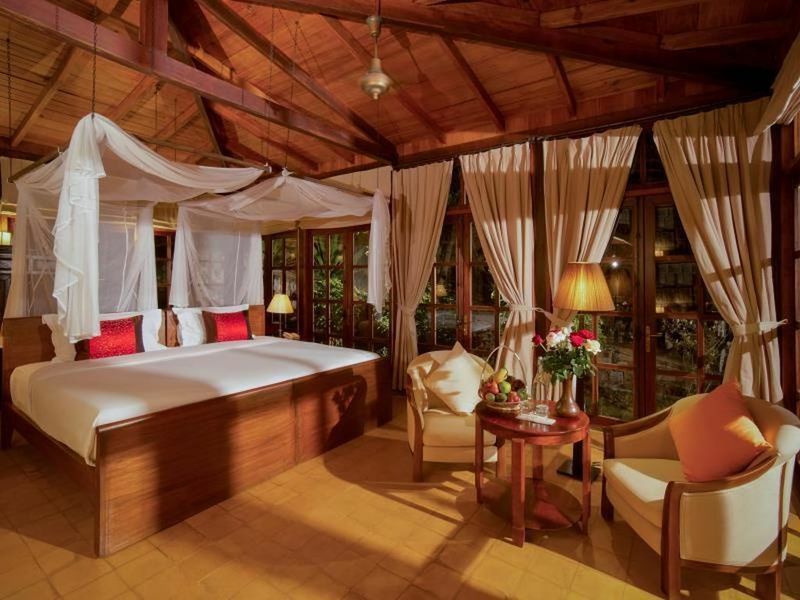 This resort takes you back to the sixties, the French colonial period. A nice experience. The villa we stayed did not have a nice view so, there was nothing impressive. The breakfast buffet is good. One night would be good enough just to experience it. DaLat provides an enchanting travel experience and Anamandara resort is a great way to experience it. In fact, we felt it was the highlight of our VietNam sojourn with its greenhouse farming, pine trees and cool weather. The place was maintained very well and was also sparkling clean. The TrucLam cable car ride from the monastery is a must, and so are the beautiful flower gardens which seem to be all over the place.. This is the second time we've been here. Love the garden the view and caring staff. We like the breakfast buffet. However, only when been served a la carte breakfast, the Pho tasted like 2 minutes noodles! A bit disappointed but because we love this hotel, we still want to come back.